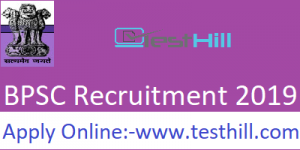 Short Info:- The department, Bihar Public Service Commission (BPSC) has released the BPSC Assistant Engineer Recruitment 2019. BPSC Recruitment 2019 is released to fill up the Assistant Engineer(Civil Trade) vacancies. BPSC Notification is available on the official website i.e. www.bpsc.bih.nic.in. Candidates can visit and check all the essential information regarding the BPSC Vacancy 2018-19. BPSC Online Registration has started on 7 February 2019 and it will be going on till the 14 Feb 2019. The BPSC AE Notification is available on the official website, one can check all the information about eligibility criteria. Also, visitors can check all the links and information from our website as well. We have updated most of the information regarding the BPSC Assistant examination such as BPSC Admit Card, BPSC AE Notification. Candidate needs to read the full article to check all the information regarding the BPSC Requirement. The registration for the BPSC Assistant Engineer Recruitment 2019 is opened now. All the aspirants are advised to apply before the last date i.e. 14 Feb 2019. Authority will not be going to accept any further application in case of crossing the last date. We will provide all the authentic information even after the examination. So, all the candidates can stay updated by visit on our website after the examination. Also, we will provide BPSC Final Result 2019 on this page. In the process of registering in the BPSC Recruitment, one has to provide some personal credentials such as current age, educational qualification, name, address etc. The department released an advisory not to share your personal data with anyone to avoid any fraud. Given data while making the BPSC Assistant Engineer Recruitment 2019 must be authentic as the authority is very strict about the documentation process.